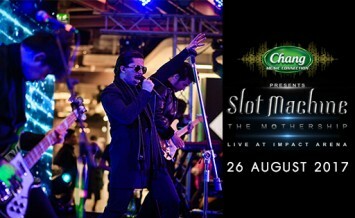 "Chang Music Connection Presents “Slot Machine – THE MOTHERSHIP Live At Impact Arena” on Saturday 26 August 2017"
▲ Slot Machine is getting ready to take fans on a new journey into their universe with a large-scale concert, Chang Music Connection Presents “Slot Machine – THE MOTHERSHIP Live At Impact Arena” on Saturday 26 August 2017 at Impact Arena, Muang Thong Thani. ▲ Tickets go on sale on Saturday 20 May at 10:00am. at all ThaiTicketMajor outlets or at www.thaiticketmajor.com. ▲ Tickets starts from Bt800.